Snap Frames are the perfect way to neatly and professionally display posters in and around your business. Waterproof Snap Frames are a great option if you are looking to display a poster in an area with water, such as outside, bathrooms or kitchens. 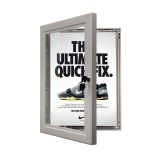 Outdoor Snap Frames are built with a thicker frame to keep your poster in place through harsher weather conditions. Outdoor Snap Frames can also be designed with a lock feature to completely protect your artwork. 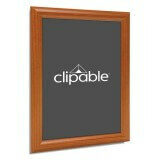 Snap Frames can be used all around your business. 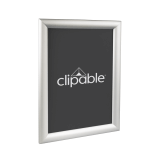 Snap Frames are poster frames that are designed with an easy to use click frame functionality that holds your poster in place. Snap Frames are available in a variety of colours, sizes and styles so there is something to suit your business styles and needs. Snap Frames couldn’t be any easier to use. The clip frame mechanism opens from the front on all four sides of the frame. This then releases your poster and it’s protective cover, allowing you to take out your current graphic and replace with your new one. The frame then simply clicks back down into place, keeping a firm grip on your poster. Do I need a Lockable Outdoor Snap Frame? Having a lock on your Outdoor Snap Frame just adds a little bit of extra security if you feel like you need it. If your poster is going to be outdoors overnight, with a Lockable Snap Frame you can rest assured that your graphic is safe and won't be defaced or stolen. How do I attach my Snap Frame to the wall? All of our Snap Frames come pre-drilled with wall mounting holes and are supplied with Rawlplugs to help you permanently attach them to your exterior wall. If you are creating a Waterproof Snap Frame for indoor use, the frame can be mounted using adhesive if you do not wish to drill into your wall. If you are using the frame externally, we recommended drilling the frame to the wall for extra security and stability. Are the Snap Frames fully waterproof? The frames are not completely sealed around all edges, so they are not 100% waterproof. They are however weather resistant. They will protect your poster from certain weather conditions but will always be susceptible to some rain or condensation. What do the frame sizes mean? The wider click frames simply offer a bit more grip than their thinner counterparts to securely hold your poster and protective cover in place. For example, our 32mm Snap Frames are more suitable as Outdoor Snap Frames than our 25mm ones. This doesn't mean our 25mm frames are only for inside, our wider frames are just more suited to harsher conditions. Will my image be protected outside? Yes, your poster will be protected by one of our UV anti-glare PVC poster covers. 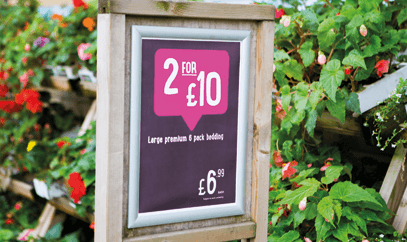 These are great for Outdoor Snap Frames as not only will they help protect your poster from wet weather, but they will also help to stop your poster fading in the sun. When it comes to using an Outdoor Snap Frame, to keep your poster looking it's best come rain or shine, we highly recommend printing onto a waterproof based insert such as PVC. This way, not only do you now have a waterproof snap frame poster, but your poster will not crease as quickly or harshly as standard paper would. How do I stop people tampering with my new Outdoor Snap Frame? As Snap Frames are so easy to open, people may be tempted to remove or tamper with your poster. Whilst a Lockable Outdoor Snap Frame is a great deterrent, their are also Tamper Resistant Snap Frames which can only be opened by authorised personnel using a Snap Frame Lever Tool.